The Uzbek women of Uzbekistan and Tajikistan in central Asia are known for their beautiful embroidered Suzani panels, worked in silk threads in hand embroidery on a heavy cotton or silk/cotton blend fabric background. Many of the patterns on historical and antique cloths have been traced to the Bukhara (also famous for its tambour embroidery) area of what was once part of India as well as Shah¬risyabz, Nurata, Khujand, and Baisun areas. Suzani have been traditionally made for use as wall hangings, bedspreads, furniture throws, pillows, or table coverings. They are hand-embroidered textiles traditionally made by family members for a Central Asian girl’s dowry. The making of these gorgeous textiles starts when a baby girl is born, and embroidery on these items continues with the help of family and friends until the girl reaches marrying age. A bride from a well-off family would often have ten to fifteen of these hand-embroidered textiles in her dowry at the time of marriage. These textiles would be used as bed coverings (especially for the bridal bed), dividers between living and sleeping quarters, as well as prayer mats and wrapping cloths. A single Suzani could have multiple functions, depending on its size. As the popularity of Central Asian textiles increased, so has the frenzy to collect these unique pieces of traditional textile art, with collectors snatching up prized samples of Suzani at flea markets and antique markets in the former Soviet Union (Uzbekistan was under Russian rule from 1860's gaining its independence from the Soviet Union in 1991) and throughout central Asia. 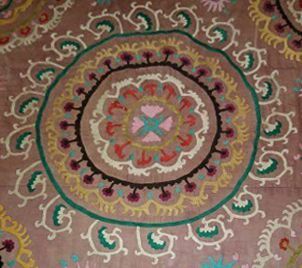 Suzani were highly prized by their owners and used only for special occasions, which is why so many antique samples are available today. When not in use, the items were kept carefully folded and stowed away in trunks. The designs for Suzani were worked in bright, lively colors of embroidery thread on a natural-colored background. The embroidery fabric was often dyed before use with a tea bath or a dye made of onion skins to darken the fabric before embroidery. The embroidery designs and patterns used in Suzani are thought to have derived from pre-Islamic motifs used in central Asia and were passed along the silk road. They are believed to have been influenced by Zoroastrianism, zodiac signs and other magical symbols, which have evolved over time into the geometric designs and floral motifs that are used in this style of embroidery. Motifs featuring birds, fishes, trees, fruits, plants and herbs as well as knives and daggers are used symbolically to signify fertility, purity of the heart, curative powers, and protection from danger and evil spirits. The pattern below features a traditional circular motif featuring flowers and concentric rings, each featuring a different design, and can be worked in basic surface embroidery stitches. Traditionally, the background for Suzani was composed of strips of fabric measuring about 14 to 20 inches in width. The number of strips used depended entirely on the finished size of the item, or on its intended use. These strips were basted together, and the embroidery design was then transferred to the fabric before stitching. After transferring the design to the fabric, the basting stitches were removed, and each strip was embroidered separately – often by different people – and then reassembled when all sections of the design were completely stitched. This resulted in irregular pattern or color matching when the strips were rejoined, giving Suzani their characteristic mismatched look. While Suzani were traditionally worked in yurma, a form of chain stitch done using a tambour hook, a standard chain stitch filling* can easily be substituted. You may also want to try filling the areas with long & short satin stitch or stem stitch filling. In this sample pattern, I have traced a single motif from an antique Uzbek Suzani, and have matched the colors in the original to DMC Embroidery Floss. If this floss is not available in your area, use a conversion chart to find the proper color numbers for your favorite floss.